Striking bi-colored, red and green, crystals of Uvite on a matrix of crystallized Magnesite. I have seen more than my share of Uvite specimens but this is the first bi-colored Uvite that I have encountered. All the crystals are complete with no damage with the largest measuring 1.2 cm. another feature of this specimen is that the dominant color is either red or green, depending on the angle that the Uvite crystals are viewed at. 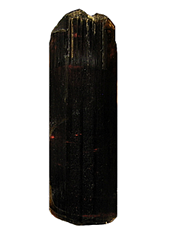 A wine-colored Tourmaline with a needle-like form from Brazil's renowned Cruzeiro Mine. The core of this Tourmaline is deep red-purple in color. This is a striking and strange-looking tourmaline with excellent color. This crystal is complete all around with no damage. 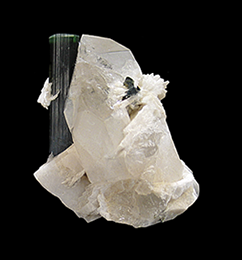 This well crystallized Elbaite Tourmaline has an unusual blue-colored, complex pyramidal termination on green-yellow body. This crystal is complete all around and is quite clear. 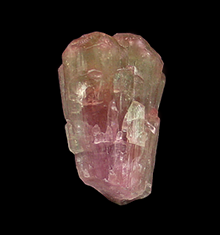 There is a micro-coating of Cookeite which gives the body of this Tourmaline a frosted look. This is a good-sized example of this material. These are older specimens from the early 1990's. Examples of this material are all but nonexistent these days. Here is an example of one of the more uncommon mineral associations that I have seen. 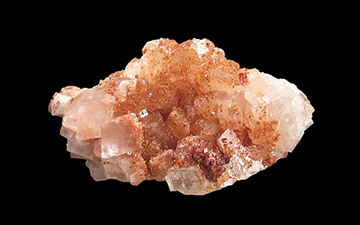 While Stilbite is not unheard of in pegmatites, it is not that common, but to find it associated with Elbaite virtually unheard of. 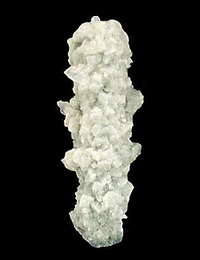 This Elbaite crystal is covered in a jacket of Stilbite crystals, measuring up to 1.5 cm in size. These specimens were found around 1990 and were a one-off find. A very colorful double-terminated crystal of the variety of Tourmaline, Liddicoatite. 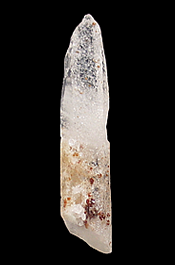 This crystal has a good lustre and portions of it are translucent to clear. The color-zoning on this specimen not only changes down its length but also from its center outwards. 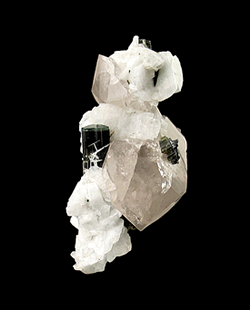 This is an unusual specimen of Quartz and Tourmaline. I'm not sure how it formed, but it caught my eye right away when I saw it. 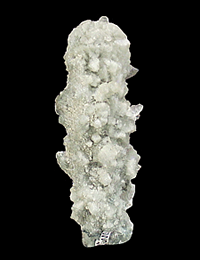 This specimen features many crystals of Quartz which are blanketed in very fine crystals of of Dravite (which were very hard to to photograph). 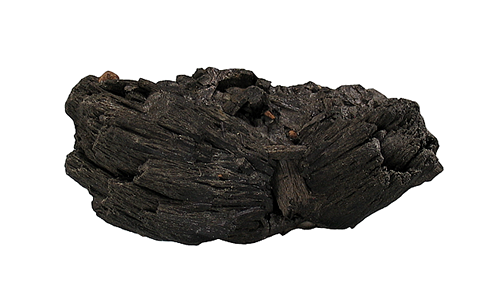 This specimen is undamaged. Specimens from the mine began to appear in the late 1980s. Unfortunately, there was usually an inordinate amount of damage to most specimens, and there are not a lot of specimens that survived, damaged or undamaged. 5.1 x 1.1 x 1.1 cm. A gemmy, brilliantly-colored Tourmaline crystal that was broken by tectonic activity in the pocket, bent, healed and continued growing. 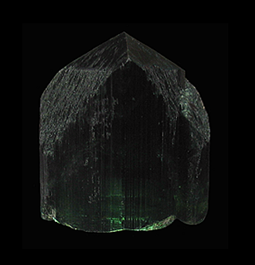 This crystal has a good bottle-green color and an excellent lustre. With just a little bit of illumination from above it will really stand out in your mineral cabinet. In the 1990's these spectacular Tourmalines were quite abundant but are seldom seen for sale these days. This location is now considered to be all but defunct. 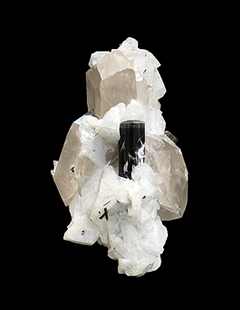 This Tourmaline has a good luster and has sports a cape of Albite crystals. 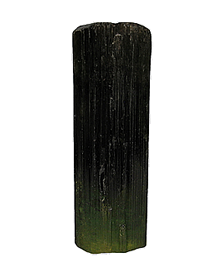 With the price of Tourmaline being what it is these days, it's getting harder to find Tourmaline specimens at a decent price. 10.7 x 5 x 4.1 cm. A stout assemblage of Tourmaline crystals from Sonora, Mexico. 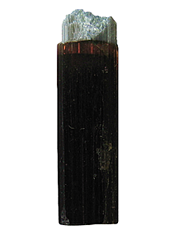 This Schorl specimen sports a satin-like lustre. This is old material and rarely seen as crystals this large. 5 x 4.8 x 3.1 cm. A beautiful gemmy dark-green-blue single terminated Elbaite crystal that weighs in at 126 grams. This crystal is from a huge find made in 2008. I purchased a few of the Tourmalines from the find and for the most part have been sitting on them, only recently selling them. 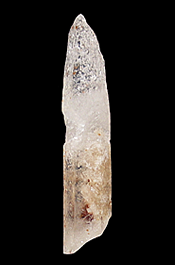 The bottom two-third's of the crystal is quite clear and is striated all around and the termination is complete. The Cruzeiro Mine is one of the worlds most important gem and specimen mines. 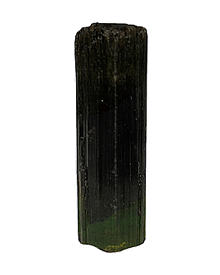 This Tourmaline weighs in at a respectable 126 grams. 2.8 x 2.4 x 2.5 cm. 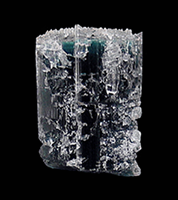 Just when you think that you've seen it all from Afghanistan, there's this specimen A lustrous crystal of Schorl that is include by a clear, colorless Beryl crystal. 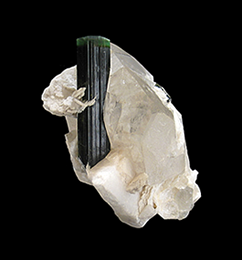 The Beryl continues down the length of the specimen with a small portion protruding from the Schorl's bottom. Another neat feature of this specimen are the pronounced and well-formed growth hillocks on its beveled termination. I have sold a good amount of material from Afghanistan over the last 27 years and I have only seen one other specimen like this. 3.2 x 2 x 1.8 cm. 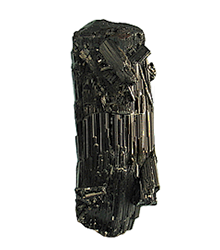 Here we have a most singular Tourmaline. An ink-blue crystal of Indicolite that looks like it were dipped in sugar. 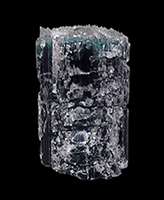 This crystal has a dark core with a layer of lighter blue and a jacket of clear Tourmaline which has been partially dissolved giving it an etched look. When properly lit from above this Tourmaline really stands out in your mineral cabinet as it did when it was in my collection. 5.5 x 2 x 2.5 cm. 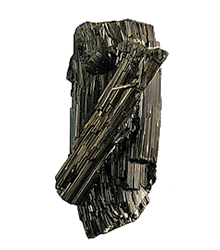 A curiously bent and twisted double-terminated crystal of the variety Tourmaline, Schorl. Mantena is mostly known for producing specimens of Apatite and Siderite but also produces very attractive schorl crystals too. 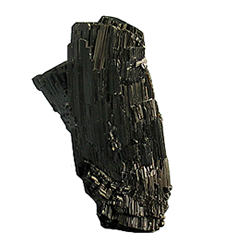 For a black mineral specimen, this Schorl has a lot of pizazz. This specimen has been displayed in many of my numerous award winning competitive exhibits. 4 x 2.7 x 2.6 cm. 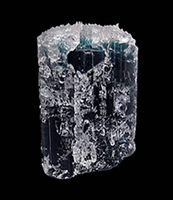 This Tourmaline has a deep-blue core surrounded by a layer of lighter blue, capped with a layer of translucent green. When I purchased this specimen it was labeled as being Indicolite. 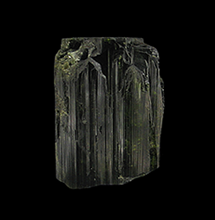 No matter what you call it it is an interesting Tourmaline crystal. It is damage free, even though it may look a little rough in the photos. 3.6 x 4 x 1.1 cm. 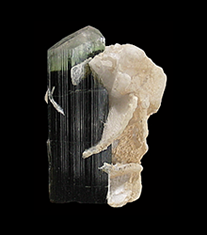 Here we have a double-terminated, deeply-colored green Tourmaline crystal perched on a matrix of Albite and Cookeite. 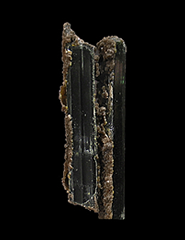 This Tourmaline is what I call "slightly tortured" in that it exhibits evidence of being bent, broken and re-healed. A very interesting specimen and a good conversation piece. 6.5 x 7 x 4.3 cm. Here we present a differnt type of mineral specimen from Afghanistan for a change. 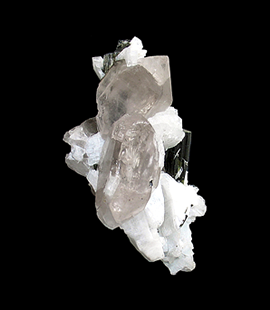 Resting against a cluster of clear Quartz crystals are the remains of 2 Spodumene crystals. 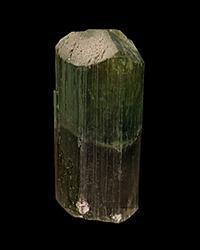 The Spodumene has been replaced by a myriad of needle-like, green crystals of Elbaite Tourmaline. This specimen is quite attractive and would brighten up any mineral cabinet. 3.7 x 1.7 x 1.7 cm. 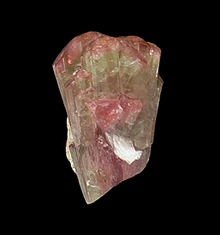 A transparent and gemmy bi-colored Elbaite crystal with a frosted, modified termination. I haven't seen an example of these Elbaite crystals in quite some time. They are from an older find, from the early 1990's, when they were available for a short time. This crystal is a lot clearer than is apparent in these photographs. In a time when the price of Tourmaline of any good quality is just downright ridiculous, I think this specimen is priced rather fairly. 4.6 x 3.1 x 2.5 cm. 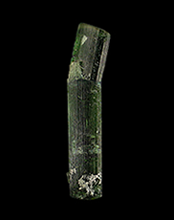 A good example of Tourmaline with the classic Luc Yen form. This specimen tapers outwards and culminates in many stepped terminations. 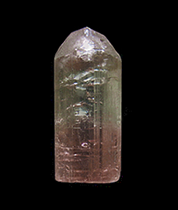 This Tourmaline has a pink core with a jacket of green encasing it with a very thin, gem-clear red outer skin. This combination of colors is the typical blending of light green, pink and reddish hues that this location is noted for. 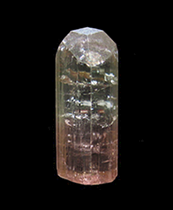 This Tourmaline is complete with no damage, just an area of contact on the lower side as can be seen in the 3rd photo above. 5 x 2.6 x 3 cm. 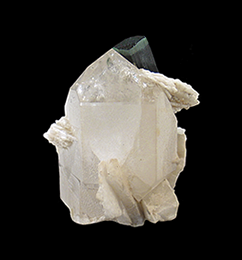 A classic double-terminated Elbaite exhibiting a hemimorphic form. The color-zoned portion of this Tourmaline is much clearer than it appears here. 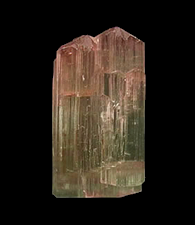 It grades from red at the termination, to pink, then to a medium-green hue in the center, then back to pink on the bottom, with an extremely thin light-green layer on the termination. This crystal is a floater, there is no point of contact on this crystal. 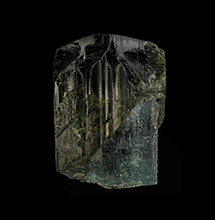 The depression on the front is due another Tourmaline growing across it, distorting the shape of the crystal. 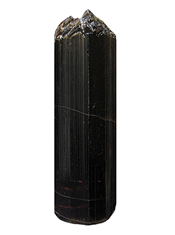 This Tourmaline is complete all around and has a cat's-eye-like lustre due to the numerous vertical striations on the crystal. 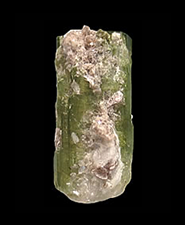 Good Himalaya Mine Tourmalines like this one are scarce these days. While sporadic work is being done at this mine, pieces such as this are not being found. These will only get more difficult to obtain in the future. 5.2 x 1.7 x .9 cm. A very rare (only found in a handful of locations) phosphate mineral in a very unusual mineral association. 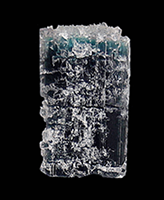 A gemmy, green-blue Elbaite crystal with a jacket of Zanazziite. These specimens were a one-time find from around ten years ago. 7.2 x 1.6 x 1.4 cm. While not your prettiest looking Quartz crystal, this specimen is kind of special. 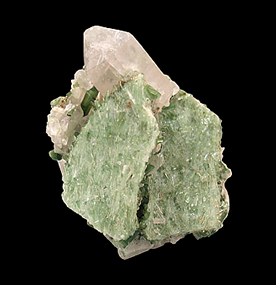 Uvite included Quartz from Brumado is not uncommon, there are many examples of green-colored Uvite in and on Quartz from Brumado. 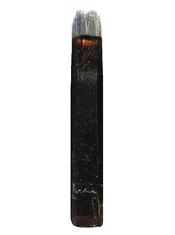 What makes this specimen special is that the Uvite is red-colored. 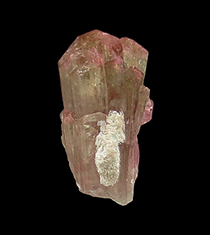 I have only seen one other example of red Uvite inside a Quartz crystal from Brumado. The Quartz is undamaged, the notch on the side is from contact with another Quartz Crystal. A very strangely formed crystal of Dravite Tourmaline. I'm guessing that its rounded off termination and abrasions are due to alluvial forces. 4.1 x 1.1 x .7 cm. I've only seen maybe 50-60 examples of these crystals, but they are quite distinct and interesting. This area has recently produced some interesting Dravite specimens including yellow, olive-green and brown crystals. More recent are these fascinating gemmy and rarely seen "root beer" colored crystals, which grade into a very thin sliver of a yellow hue (which is one of the rarest colors for any tourmaline species) and to top it off is the stark contrast in the immediate form of a silvery-blue opaque cat's-eye termination. 5 x .8 x .6 cm. 5 x 1.5 x 1.3 cm. 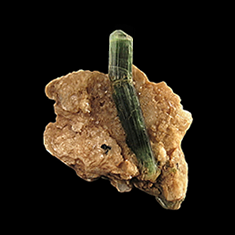 Another example of the diversity of the Dravite crystals from Tanzania. The Simanjiro District has recently produced some very interesting Dravite specimens including yellow, olive-green and brown crystals. More recent are these fascinating gemmy (when backlit) "root beer" colored crystals. 3.6 x 2 x 2.5 cm. 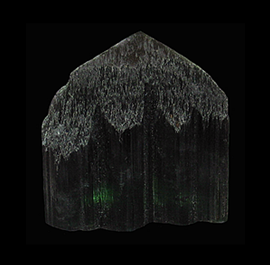 This crystal is not your run of the mill Urubu Mine Tourmaline specimen that there seem to be so many of, most of them opaque and unterminated. 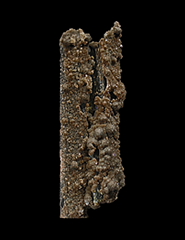 This is one of the better terminated crystals of this habit from this mine that I have seen. 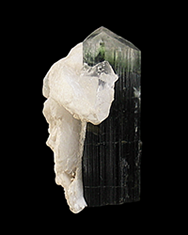 Three quarters of the Tourmaline has a center of milky Quartz, while the upper portion, while not gemmy, is pretty clear. Accenting this Tourmaline are several patches of Lepidolite. 14.2 x 8.2 x 6.1 cm. Skardu is a very active district in mining for mineral specimens. Pegmatite, alpine type and metamorphic minerals are found in thousands of small handcrafted digs. The most prolific mines are in high altitude remote areas and can be worked only in summer. 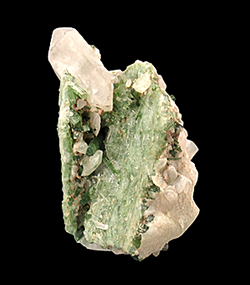 This Specimen features a 8.4 centimeter dark-green crystal of Elbaite with a 3.5 millimeter zone at the termination that is blue-green and lighter in color and is transparent. 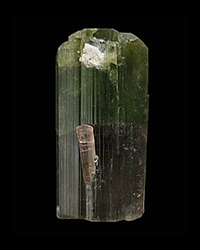 The main Tourmaline is nestled in a jacket of fractured Albite and clear Quartz crystals, the largest of which is 8 centimeters long. 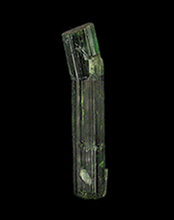 There are 2 other crudely terminated lighter-green Elbaites shooting through the matrix, the largest of these is 11.2 centimeters in length. Once more common, you just don't see these Tourmalines from Skardu that often these days. Skardu is a very active district in mining for mineral specimens. Pegmatite, alpine type and metamorphic minerals are found in thousands of small handcrafted digs. The most prolific mines are in high altitude remote areas and can be worked only in summer. 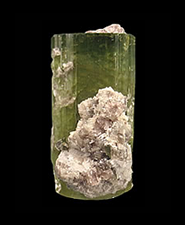 This specimen features a 5.5 centimeter dark-green crystal of Elbaite with a 5 millimeter zone at the termination that is much lighter in color and is transparent. 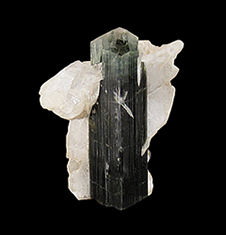 There is a second Tourmaline that measures 4.4 centimeters and is almost completely encapsulated, just the smallest hint of a termination protrudes from the rear, in the Quartz & Feldspar matrix. The Quartz crystal is complete all around and is fairly clear. 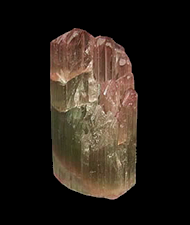 Accenting the main Tourmaline is a 2.5 centimeter rosette of Cleavelandite. You just don't see these Tourmalines from Skardu that often these days. 4.4 x 2 x 1.7 cm. Here we present a well-formed, mostly transparent, single crystal of Tourmaline from the world-famous and prolific Himalaya Mine. 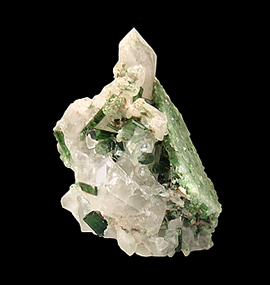 The crystal grades from a mossy green at the bottom to a brighter green about midway up with a reddish-pink “hitchhiker” crystal jutting from its side. The termination wraps around a piece of Feldspar. An unusual combination of colors from a classic Tourmaline location. 6.3 x 3.5 x 3 cm. I've handled a lot of Uvite from Brumado over the years but don't recall seeing any material of this color before. This specimen features rhombs of nearly clear Magnesite festooned with sub-millimeter, orange-colored crystals of Uvite. The few larger Uvite crystals are more red-orange in color. While there is some minor bruising of the Magnesite, I think that is acceptable in this case as the main feature of this specimen is the unusually colored Uvite crystals. 5.2 x 1.8 x 1.9 cm. A nice Elbaite Tourmaline from the famous Cruzeiro Mine of Brazil. 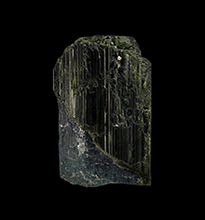 This striated crystal exhibits a pleasing grassy-green color in the bottom portion, grading to a darker green in the middle and grading back to an olive-green/green termination which exhibits slight signs of etching. A good undamaged Tourmaline from a famous location.